RIGHT NOW OUR POPULATION CAN BE DIVIDED UP INTO PEOPLE WHO HAVE AMASSED SUBSTANTIAL EQUITY AND WEALTH, SIMPLY BY OWNING A PROPERTY OVER THE LAST FIVE YEARS. AND THOSE WHO FEEL JADED, BITTER AND WORRIED ABOUT HOW THEY WILL EVER CRACK INTO THE PROPERTY MARKET. Granted I am heavily biased towards Sydney siders who live in the North Shore and Eastern Suburbs as that is where the majority of my clients are based. However none-the-less, regardless where you happen to reside, if you don’t own a property right now, I’m sure these feelings are mutually felt right around the country. This post will seek to provide you with some realistic options to think about and perhaps provide some comfort as to how a potential future looks for you. At the crux of this issue is affordability. And whilst everyone has a different scenario, for the point of this post, I’m going to presume you are a couple in your mid-thirties with one child and you’re after a 2-bedroom apartment somewhere around the Chatswood area. First up, let’s see what’s available. I’m going to Domain to see how many 2 bedders are available for sale for $600K or below. Alright, opening up the search with no specific price criteria, let’s see what the reality holds. So it appears that if you want a two bedder along the lower North Shore than it’s going to cost you at least $850K to secure something. Presuming our couple finds something they like for $900K, how do the numbers look? Well with a bit of luck, I could probably get an approval from one of only a handful of lenders in town that can do a 95% LVR + uncapped LMI. This would mean, factoring in stamp duty etc, plus a $10K buffer, the loan our couple would be left with is $894,000 (which includes a $44,000 LMI fee). Presuming P&I repayments and a current rate of 4.24% (which will only go up over the coming years), it will cost our couple $1,023 per week in minimum repayments to hold this property. It’s a term donned only over the last couple of years to define the growing number of Australians that have made the decision to rent rather than have an owner occupied property and use their savings to acquire investment properties. Alright, well that’s a lot more promising. Presuming our couple can get something for $650 per week, that is going to be $373 a week cheaper than if they were to purchase something similar! Regardless of which capital city you may reside, it’s pointless to look at these cities as individual markets. Rather, they are each broken up into a number of sub-markets, each having dramatically different price points. Take for instance the Sydney suburb of Northmead, 26 kms from the CBD and sitting right next to the Parramatta CBD. Going back to my first criteria I did at the start of this post, let’s see if we can find anything for under $600K. If you look at the top of the above image, it’s showing 100 properties with two bedrooms or more for sale below $600,000. Again, factoring in stamp duty etc, plus a $10K buffer, the loan our couple would be left with for a $590K purchase price would be $536K, including an $11K LMI fee. That’s a full $358K lower than if they were to purchase something comparable in the Chatswood area. How does the Northmead rental market look? 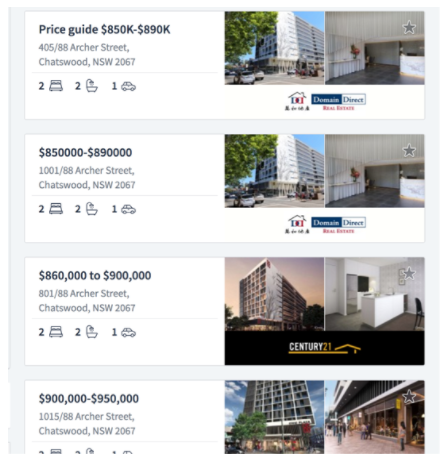 Just like we did for the Chatswood example, let’s take a look at what a 2 bedder in Northmead would rent for. Looks like it’s around $500 per week. Factoring in interest only repayments, the home loan would cost $439 per week so holding costs are virtually zero! The point of this article is not to discuss if Northmead is a good suburb to invest in. Rather, it’s been used as an example to show that with some strategic planning, $100,000 is more than enough to find a suitable property to buy. You just need to be open to look beyond areas you are probably used to. Does this strategy solve the problem of being able to purchase a property in your ideal area? Maybe not right away. But, it does allow you to get started in the property market and accumulate equity just like those that currently own property have experienced over the last few years. Why such fantastic growth for commercial properties?